This recipe would be nice for a light lunch or brunch on the weekend. 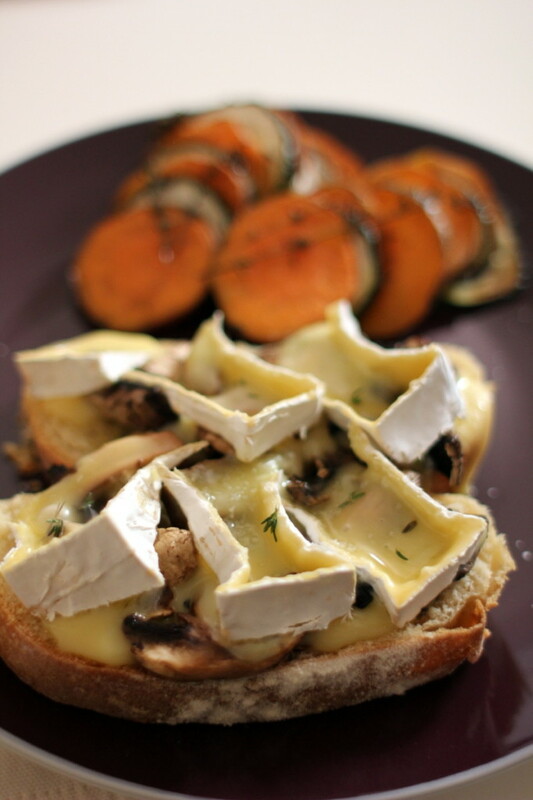 It is so perfect flavour combination – creaminess of brie cheese with wild mushrooms. You can make soup, bisque, pizza, risotto, omelet, pie, canape..endless.. You name it! It will work beautifully. On to the vegetable Tian, it is originated in Provence, the south of France. 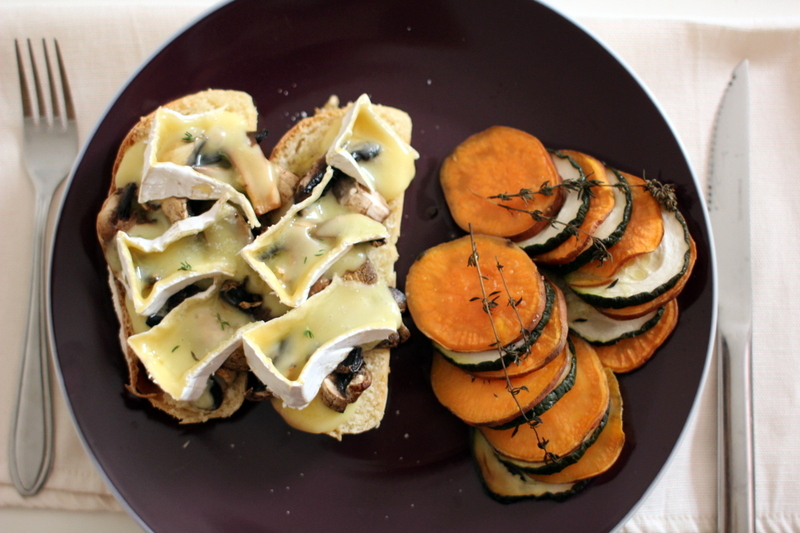 Tian refers to the baking dish and roasted vegetables – the word explains all. It can be topped with some cheese, but I prefer it simple, fresh and clean taste. These two dishes together on the plate look elegant and tastes so good. Every mouthful has a punch of flavour! Simply arrange alternating layers of slices of sweet potato and zucchini in the baking dish, and bake in the oven with fresh thyme and e.v.o.o until it’s all cooked. You can add eggplant or tomatoes as well. When it comes out of the oven, colours and presentation looks stunning. I reckon it is definitely a wow factor when you have dinner parties. I had a baking spirit again this morning. I was making a basil pesto, then thought why not making rice cakes with it? The base of rice cake is plain rice flour and a small teaspoon of salt and sugar. Then I topped with blended basil and cashew nuts, and steamed for about half an hour. Once it’s cooked, dress it with drizzle of honey and pink peppercorns. 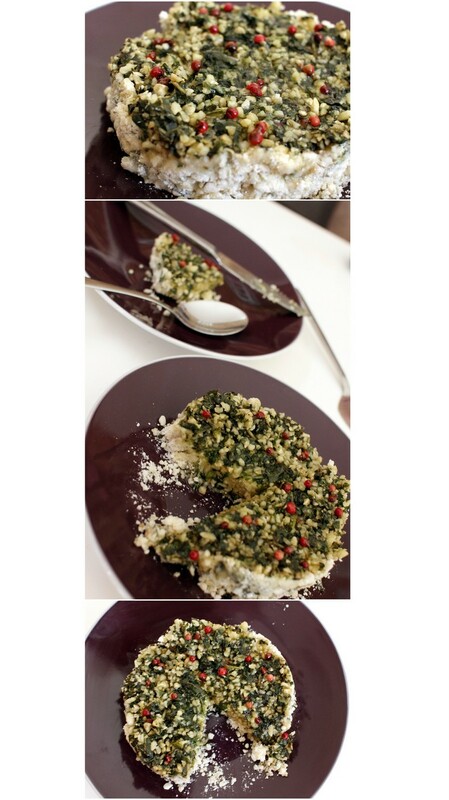 It is moist and sweet at the bottom layer then crunch and savory from the basil pesto layer. Earl Gray is one of my favorite teas (yes, I am a tea drinker). 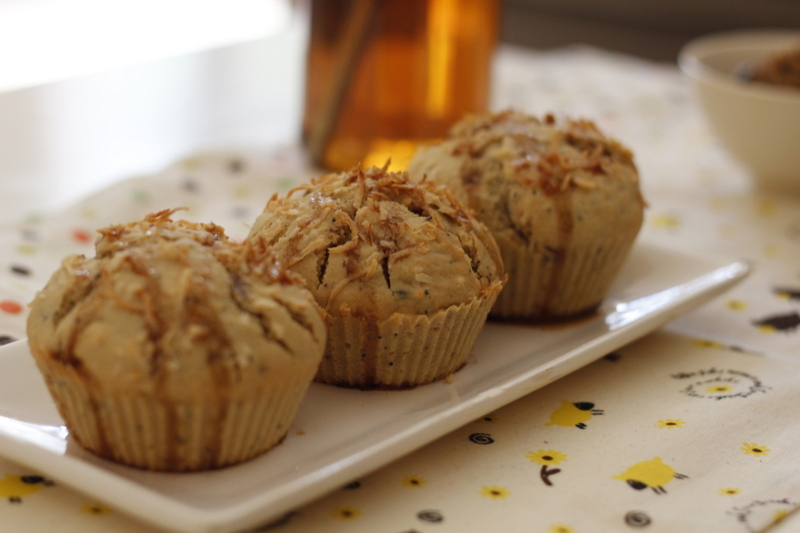 I think it goes really well with baking and dessert dishes among other teas such as cakes, muffins, panaa cotta, ice cream, cookies, macaroons, endless…Just thinking about all that makes me drool hehe:) I made these muffins for Daniel’s breakfast topped with coconut and ginger maple syrup and he finished all (a good sign!). Only a few days left until 2014. Where has this year gone? I really need to look back this year and plan for the new coming year….